Feature of Yugamiru | gsport,inc. Two analytical reports are output. Highly effective and convincing advice is provided in the two page report printed after the measurement for improving the impediment caused by the body distortion. The poor condition of the posture is confirmed with photos and in numeric values for easy recognition of the problem. From the condition of the posture, muscle tension and loosening is estimated and displayed in various colors. While standing on the specified mat, the test subject follows instructions displayed on the monitor. Photo are then taken in a side and bent positions to be analyzed. Size of the mat is only 70cm x 70cm, operable anywhere. 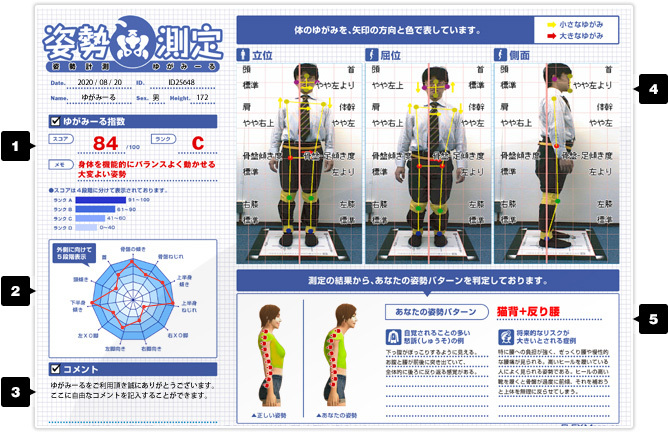 Following the instruction on display of "Yugamiru", just click few points of the joint positions to evaluation the state of each distortion in the body. From the result of the analysis, the condition of the muscle from the posture distortion is estimated and printed on a two page report on site. The distortion of the body is automatically analyzed and reported for provision of accurate advice. The state of the posture is confirmed with a photo along with numeric value of the evaluation for ease of understanding by anyone. From resulting measurements, the posture is categorized as to the corresponding type; the evaluation result may be further added and modified.